One of the most popular and versatile murals you can paint, cloudscapes can be painted as beautiful soaring ceilings on their own, or serve as the base for grand figurative or architectural murals. A well painted cloud ceiling mural can raise up the ceiling and create the illusion of height, and enliven the architecture while bringing color and a sense of light to the room. In this intensive workshop, learn techniques for painting decorative cloud ceilings that are artful, colorful, and surprisingly fast to produce. We'll explore various aspects of good design such as composing cloudscapes of different shapes and sizes to suit the proportions of the ceiling, and creating color palettes for tailoring the mural to the room and its decor. 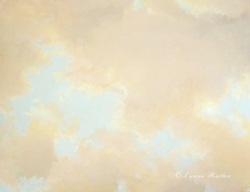 Avoid the trap of painting "flying boulders" and create skies that are luminous and airy. Creating palettes for different colors and "moods" of skies - allowing for more expressive and painterly murals. Marouflage techniques for adding figures or birds into a ceiling or for installing a canvas mural in general. 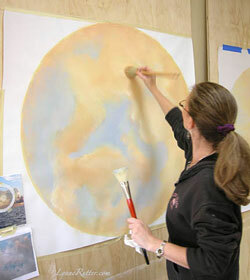 Participants will create their own unique full-scale cloudscape panels. Price includes all paint and materials used in class, full-size mural panels, detailed class notes. class hours: 9:30 AM to 5:00 PM. On Line reservations for this class are not being accepted at this time. Contact the studio for waiting list or to inquire about this or future workshops.